From busting dams, taming mountains, taking on the Toon, partying at the Port and making their mark in the East it was a busy and successful week for Ballymena Runners! The inaugural Connswater 5k/10k road races were held on Sunday and, as usual, Ballymena Runners excelled themselves. In what was a well organised event throughout the route encompassed some notable landmarks in east Belfast, namely CS Lewis Square, Victoria Park, Connswater Greenway, Sam Thompson Bridge and the Harbour Estate. Congratulations to Paula Worthington and Geraldine Quigley on filling the top two positions in the 5k. Paula claimed top spot in a time of 19:47 while Geraldine came in second, recording a 21:17 finish. Also competing in the 5k were Margaret Duff (32:59), Louise Strange (38:01), Elaine Nicholl (40:55) and Lisa Kirkwood (40:56). Linda Petticrew picked up another age category win in the 10k race (46:56), finishing 6th lady overall while Jim Weir (55:43) and Lynsey Gordon (57:04) also contributed to a strong showing from the club. Congratulations to Linda Petticrew who led the Ballymena Belles charge at the Purple Ladies 5k race around Ballymoney on Wednesday evening. 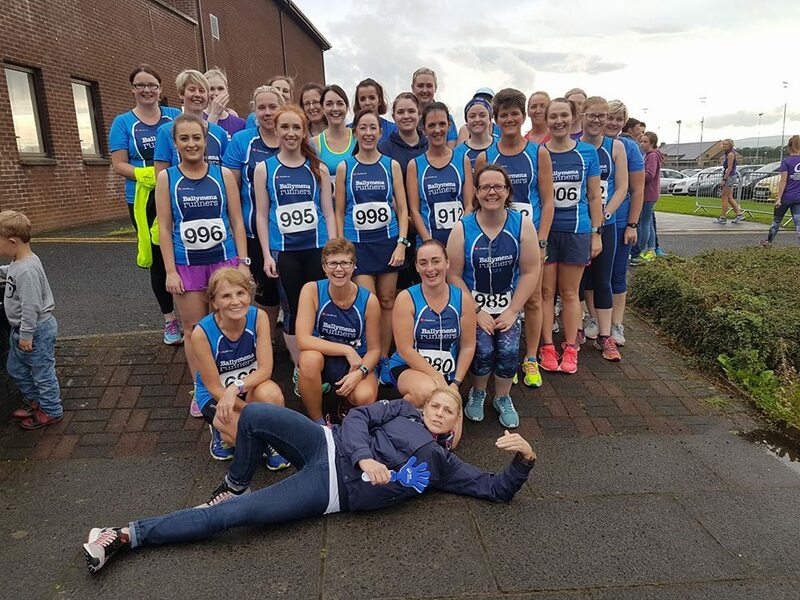 Outside of hosts, Springwell RC, Ballymena Runners were the best represented club with around 30 runners taking to the start at the Joey Dunlop Leisure Centre. Linda was first home, and 8th lady overall, in an age category winning time of 22:03. Alison Foster produced an impressive performance. Not only was Alison the second Ballymena runner to cross the line, she also finished second in her age category and picked up a new personal best (23:07) to boot! Well done Alison. Sinead Scullion, Kelly Courtney and Kathryn Grant completed the rest of the Ballymena top five while Brigid Quinn collected a category win (27:55). On Saturday over 600 runners descend on the picturesque Silent Valley Country Park in the heart of the Mournes for the Dambusters Half Marathon & 10k races. Pamela Kane was first Ballymena runner home in a time of 1:55:06. Next up was Robin Alexander (2:00:07), Gemma Macrory (2:01:51) and Paul Cupples (2:03:15), a strong showing on a challenging course. Meanwhile, in the 10k, Norman and Sharon Stephens both finished in 57:30, just ahead of Patricia Macrory who crossed the line less than a minute later. Mountain runners from all over Northern Ireland made their way to Slieve Bearnagh for the latest event in the NIMRA Championship. Amongst them were club duo Connor Reid and Gillian Wasson. Connor finished the 3.9 mile route in 7th spot overall, clocking a time of 53:51 whilst Gillian crossed the line in 1:04:29. A few members of the club indulged in a little bit of parkrun tourism on Saturday. Held on the East Strand Beach, the Portrush event is the first beach parkrun in the world and first over the line at the weekend was Jason Wilson (18:56), his fifth time finishing in pole position and follows on from his fifth place finish in London's Crystal Palace parkrun a couple of weeks ago. Mark Alexander finished 10th overall (21:23) while Judith Worthington (22:56), David McKean (24:41) and Harry Armstrong (31:39) also competed.